As I'm sure most will agree, it can be rather heart breaking to see your favorite blade rust away, especially if you spent a long time saving to buy it in the first place. Of course, not all swords are created equal, and some will need more effort than others to keep shiny and new in appearance. But with a little time and patience, you can make your entire collection last for a lifetime. As you can see here, this item is fairly heavily rusted from old age. This is after a single use of CLR to remove rust from the guard. Previously, the guard was darker than the grip. After a single pass with the rust remover, the superficial rust was removed, but the deeper rust remains. If you keep your swords on display and never handle them, typically you won't need to do much to keep them looking their best. The more you handle it, the more you may need to take care of it. This page will show you some simple methods of maintaining your swords. For primarily decorative swords, including many of the "non-functional" replica swords, maintenance can be quite easy. Often these swords are made with an aluminum alloy or a similar substance rather than steel. Aluminum doesn't have a problem with rusting or tarnishing. Aluminum oxidizes instantly, and the outer layer of it protects the inside, so you don't have to worry about further oxidation. Unlike rusting steel, oxidized aluminum does not flake away and result in corrosion of the metal, but instead protects the inner metal. Many inexpensive decorative swords will have a zinc-aluminum alloy, which will maintain a steel-like polished appearance without corrosion. It will scratch relatively easily, however. Whether it is a decorative sword or not, if any of the fittings, guards, or pommels are made of brass, bronze, silver, or copper, you may see these parts getting tarnished over time. Tarnish will set in extremely fast if you handle those parts frequently. Most hardware stores and/or grocery stores sell chemicals that you can use for cleaning up these metals and removing tarnish, so this is easy to take care of. For cleaning brass, a good choice is "Brasso". Be careful though, some of these same chemicals can be harmful to aluminum, so if it is a decorative aluminum sword you should be careful not to get any on the blade. I would also recommend using gloves since some of these materials can be unkind to your skin. Brasso has a tendancy to dry out your skin remarkably fast. For swords with steel blades, rust can be an issue (stainless or not). If the sword is already rusty, there are a variety of ways to remove the rust. Unfortunately, due to the nature of rust, you may never get all of it out, and even if you do, the surface of the blade may be forever pitted or scratched. If the rust is relatively light or superficial, it may in fact clean off completely without leaving any easily visible scars. Also, you'd be amazed how much better it can look after rust-removal even if the rusting was rather severe. Before starting on cleaning and rust removal, it is a good idea to clean the blade of other substances, such as skin oils, or protective oil and wax that may have been applied previously. This can be done with denatured alcohol (available from drug stores, but be careful since it's poisonous), or even isopropyl alcohol. On occasion I've even used soft liquid dish detergent and water, but be sure to dry the blade well with a soft cloth (paper towels will often due, but ideally a cotton cloth is better) thoroughly since you don't want to leave residual moisture on the blade. To remove rust, you can use a chemical treatment that you can buy at your local hardware store, or you can use a "Rust Eraser" as long as you are careful not to scratch the blade (the "Rust Eraser" is actually quite abrasive, so I'd recommend not using one unless the rust is very severe and you don't expect to maintain a smooth surface). CLR (Calcium, Lime, Rust) is a popular choice. You may have to use it several times though, if the rust is persistent. And suprisingly, you can use Brasso as an effective rust-remover on steel. For some of the spots that form that may be resistant to removing chemically, they can often be removed or at least loosened with a regular pencil eraser. Afterwards, you may want to restore some shine to the blade with a polish. Metal-Glo is a decent polish that can be used to improve the sheen. You can also use a chrome polish as well. Remember though that a polish is an abrasive substance that removes metal. Doing this too often will have negative long-term affects on the blade, so I would only recommend doing this when you feel it is necessary. Once the sword is cleaned up, it is a good idea to seal it with something to prevent rust in the future, and help preserve the color and shine. This may not be necessary on aluminum display-swords. For steel swords it is a must. There are about as many different materials to use for this as there are collectors out there, and everyone has their own preference. 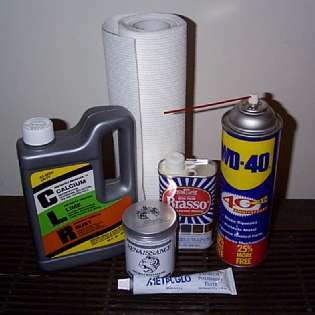 Some common choices are motor-oil, gun-oil, Turtle Wax, Vaseline, and WD-40, and medical-grade Mineral Oil. Ideally you want something that will not react with the metal, which is why gun-oil and medical mineral oil can be decent choices. WD-40 gets into the pits and crevices very nicely, but it also evaporates and is not a long-term sealant. All you need to do is apply the oil or wax to the blade evenly and thoroughly, and then wipe away all of the excess and buff it out so that you can't see that it is coated in anything. You only need a thin invisible coating on the blade to prevent rusting. If the crossguard and pommel are also made of steel, don't forget to give them the same treatment you give to the blade. A variety of materials for sword-care. As to what materials to choose, there are a few pros and cons to take into account. Polishing before sealing can be done to improve the metal's luster. Since polishes react with the steel to remove the outer-most layer, often this is only necessary when a deep-cleaning is called for or the metal has taken on a dull color. The rest of the time a simple oil or wax treatment will be appropriate. Gun-oil is cheap and abundant, and is a very good penetrant and sealant, since it's designed to protect moving parts against rust. Unfortunately it's not designed to look good, so it often leaves a smeared appearance. WD-40 goes on smoothly and leaves a good shine, so it's a popular choice, though it does dry out over time and needs to be redone frequently, and also has the disadvantage of being easy to wipe too much of it off and thus not leave a protective layer. Renaissance Wax is a bit more expensive, but a little goes a long way and it's specifically designed for this use, though on the otherhand you can get the same effect for 10% of the price with something else. Renaissance Wax also seems to have a polishing agent and mildly reacts with the steel. Probably the best solution is to use vaseline or medical-grade mineral oil, both of which should go on smooth, stay where it should for a long time, and allow you to handle it a bit without removing the protection. An important tip to help prevent pitting and rusting is to not store the swords in their scabbards and sheaths. Given enough time and the right conditions, metal scabbards can result in some unfortunate deformations of the surface of the blade, particularly if you live in coastal areas that have large amounts of salts in the air. Leather scabbards tend to extract moisture from the air and hold it close to the metal, accelerating rust. These things will not always happen, it depends on the sword and on the scabbard. Sometimes you'll be fine keeping the sword sheathed, and sometimes you won't. You can reduce the risk by treating the inside of the scabbard with oil or vaseline (not recommended for suede or soft leather), but that can be difficult to do properly, short of just gunking up the blade and running it in and out of the scabbard a few times (get your mind out of the gutter!!). More often than not, the risk is simply too high. Also, it is a good idea to avoid touching the blade whenever possible, since the acids in your skin-oils will react with the metal. For stainless steel, this often results in etching and pitting. With other forms of steel, particularly the high-carbon and mild steels, accelerated rusting and discoloration ocurr. It's also a good idea to wipe down the sword after each use or handling, particularly if you've been touching the blade. Usually it's a good idea to keep a single rag for this, one that is oily but otherwise clean. Each time you go to wipe down your sword, you can add a few drops of oil to the cloth, that way the sword gets a little bit of a fresh dose of protective oil every time. If you make a point of giving it a brief wipe each time you touch the sword, you can avoid difficult and time-consuming clean-ups in the future and keep the sword looking its best. Giving a nice thoroughly-oily wipe once a month as well (or even once a week, depending on how much you handle it) will keep it well protected. Even if you never touch the sword, eventually the oil or wax can go stale and lose much of its protective qualities. For this reason, giving it a good cleaning and re-protecting it is a good idea... once a year is usually often enough for swords on display, though you may need to do it more often if you handle the sword a lot or live in a climate that is rough on it. People who use their swords frequently will often need to clean and protect their swords daily or weekly. If it has been a long time since the last cleaning/sealing, you may wish to first wash away the old layer of oil or wax. This can easily be achieved with some dish detergent and water, as mentioned earlier. If you use vaseline to protect your blades, it may be more easily cleaned off using turpentine, laquer thinner, paint thinner, mineral spirits, etc. If you used soap on the blade, make sure to give it a good rinse and then dry it off, and then quickly follow it with the new oil/wax. A little water is not harmful. It's long-term moisture-exposure that you need to protect against. A well-polished and clean blade. Over time, depending on how effective your efforts were to protect the blade, the sheen may fade. This doesn't necessarily mean you've failed, but it will happen faster if you aren't careful. Usually the luster can be restored with a little bit of metal polish, such as metal-glo, or a chrome polish, or possibly even with Brasso (I can't even begin to describe how many uses Brasso has, it's fantastic stuff). If you have an aluminum blade, all of the tips concerning rust aren't quite so important, but it is still a good idea to wipe the blade after handling, even if just to remove unsightly streaks, smears, or fingerprints. If you follow these simple measures, you can usually keep your favorite weapons looking beautiful. Many of us have heard the same story, or experienced it firsthand... I find it really annoying when people keep emphasizing to me "don't touch the blade!" when I'm looking at their swords, or browsing over the brand-new blades in a store. It also seems almost insulting when they wipe down the whole thing after I've handled it for about 30 seconds. Well, Now I'm becoming one of those annoying people. :-) When I got my first high-carbon steel sword, I was shocked at how quickly it began to rust. I could even see rust forming in the outline of my fingers from where I had touched it soon after buying it. I've heard stories of other people's fingerprints being etched into the metal. This etching is particularly a problem with stainless steel. I even saw some rust specks form where the metal was in contact with the carpet after being left on the floor for about 2 months (I had it laid out in front of a bookcase). Just a little bit of preventative maintenance can avoid damage. I don't use my sharp swords in combat reenactment or SCA tournaments etc, so I haven't personally had much experience in keeping the edges nice (mine stay nice because they never touch anything). Most of you are probably just collectors as well, as most of the items I'm selling through this site are either entirely decorative, or they're designed such that they're capable of doing some serious damage and thus are not typically used for reenactment and the like. It's possible you may choose to use your sword for test-cutting against fruit, plastic bottles, cutting mats, pool noodles, etc. While these sorts of targets probably won't hurt your blade, it's possible you may develop some nicks in the blade along the way. For nicks on the blade, most people use a file, but others have found that with a little light hammering, the nick can be flattened out. Sharpening is easier to do with a beltsander or the more traditional wet stone than with a handheld knife sharpener. Use of a knife sharpener is only recommended if you know what you're doing... then again, I'd only recommend sharpening at all if you know what you're doing. :-) I've been told that the optimal angle to grind at is 23.5 degrees. I would strongly encourage you to seek professional assistance if you need sharpening. This page may be reproduced on your own website for informational purposes provided that proper acknowledgement and attributed credit is given to Ed T. Toton III. I would also ask that you link back to this site, but only the credit is required. Thank you.